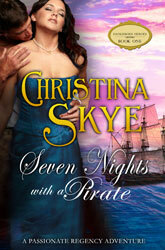 SEVEN NIGHTS WITH A PIRATE is set in the beautiful brooding marshes of southeast England near Rye. The time – 1813, at the height of the Napoleonic Wars. Who– smugglers, spies and traitors. And two brave but wounded lovers. Driven to redeem her father’s monstrous debts, Tess Leighton strikes a deadly bargain. Though gently bred, she dons a mask and cloak by night, running contraband brandy and silks across the sands of Romney Marsh. Playing a dangerous game, she assumes the role of the county’s most legendary smuggler, the Romney Fox. Slipping through the marshes by night, she uses cunning and the experience of a native to stay one step ahead of government agents determined to see her dead. After crucial military secrets are captured enroute to Napoleon, London sends its toughest agent to trap the Fox. Decorated Naval officer Viscount Ravenhurst is determined to stop Rye’s notoriously cunning smuggler and spy. But after one reckless kiss by moonlight, passion grips the cynical naval hero. Tess excites him as no other woman can, making him remember his youth, his joy, his honor. Most of all, he begins to feel the stirrings of a heart he had thought long dead. Then Tess is betrayed, falling captive of a notorious smuggler pirate. Now two unyielding rivals swear to claim her wounded heart, and Tess is caught in a dangerous love triangle that may hurt all three. Meanwhile, a clever traitor watches from the shadows, and Tess must learn whom to trust before she loses everything … and everyone that she holds dear. Published by Dell in 1991 as THE BLACK ROSE. A note from Christina: I completely rewrote the 700 page book, a real labor labor of love. I think the story sings now, and I’m hoping you will agree. This is a sweeping adventure for real historical fans. And of course, there is a passionate romance at its heart.